Freedland, Michael, Irving Berlin , London, 1974. Woollcott, Alexander, The Story of Irving Berlin , New York, 1982. Bergreen, Lawrence, As Thousands Cheer , London, 1990. Barrett, Mary Ellin, Irving Berlin: A Daughter's Memoir , New York and London, 1995. Furia, Philip, Irving Berlin: A Life in Song , New York, 1998. Hemmings, Roy, in The Melody Lingers On , New York, 1986. Hayes, H., "Of Life and Love, Of Happiness and Friendship," in New York Times , Section 2, 28 March 1993. Hamm, Charles, "Genre, Performance and Ideology in the Early Songs of Irving Berlin," in Popular Music , May 1994. Schiff, David, "For Everyman, By Everyman: In Creating Himself According to the Nation's Enthusiams for His Songs, Irving Berlin helped create a National Identity," in Atlantic Monthly , March 1996. 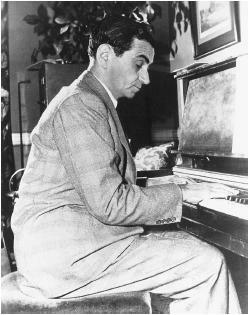 Irving Berlin's career as a songwriter was so long that he out-lived some of the copyrights of his early works. Although he was hit-making as early as "Alexander's Ragtime Band" in 1911, he was obviously barred from the cinema until 1927, when he got in at the earliest possible moment by providing "Blue Skies," a tune featured in The Jazz Singer , the first musical movie. The burst of song and dance activity that naturally followed Al Jolson's warbling found Berlin's work featured in a clutch of late 1920s and early 1930s musicals, most notably the Marx Brothers' Cocoanuts ("When My Dreams Come True," the first song Berlin wrote expressly for a film, "Monkey Doodle-Doo," "The Tale of a Shirt") and the all-black Hallelujah ("Waiting at the End of the Road," "Swanee Shuffle") in 1929, but also Glorifying the American Girl ("Blue Skies" again), Puttin' on the Ritz (the first film titled after a Berlin tune), and The Jazz Singer follow-up Mammy (with a Technicolor sequence, and "Let Me Sing and I'm Happy"). However, once the first burst of screen musicals died down, Berlin had to wait until 1935 to be offered something worthwhile in the way of a credit. Top Hat , the first of the great Astaire-Rogers musicals, features only one forgettable song—"The Piccolino," which is unfortunately the climax of the picture—but otherwise boasts four soon-to-be-standard numbers, all mounted with the maximum of RKO elegance, "No Strings," "Cheek to Cheek," "Top Hat, White Tie and Tails" and "Isn't This a Lovely Day to Be Caught in the Rain?" Here, Berlin's deft but unfussy tunes and simple but perfect lyrics are at their best, expressing neither the lyrical nor musical sophistication of George Gershwin or Cole Porter—beside whom Berlin still looks like the Compleat Tin Pan Alley Professional—and yet never seeming cheap, obvious or cynical. Top Hat was followed by the underrated Follow the Fleet , which is a better all-round movie than Top Hat —with a more congenial navy-and-showbiz New York setting as opposed to the stuffily trivial London and continental high society of the earlier film—with an almost equally good score, led off by "Let's Face the Music and Dance" but featuring also "I'm Puttin' All My Eggs in One Basket," "Let Yourself Go," "We Saw the Sea" and "But Where Are You?" Berlin would create hit-packed scores for Astaire movies again—for Carefree ("I Used to Be Color Blind") and Holiday Inn ("White Christmas," for which he won an Oscar)—as well as a few lesser talents ( Second Fiddle , for Sonja Henie) but Top Hat and Follow the Fleet were the peak of his contribution purely to cinema, most of the other Berlin movies being adapted from stage successes ( Louisiana Purchase , This Is the Army , Call Me Madam , Annie Get Your Gun ) or built around clutches of pre-existing songs ( On the Avenue , Alexander's Ragtime Band , Blue Skies , Easter Parade , White Christmas , There's No Business Like Show Business ). Meanwhile, individual Berlin songs persistently turned up, the most lavishly overproduced number perhaps being the "A Pretty Girl Is Like a Melody" riot of bad taste in The Great Ziegfeld . Berlin songs also appear in Kid Millions ("Mandy"), The Story of Vernon and Irene Castle ("Syncopated Walk"), Hello, Frisco, Hello ("Doin' the Grizzly Bear"), The Powers Girl ("A Pretty Girl Is Like a Melody"), The Jolson Story ("Let Me Sing and I'm Happy"), The Fabulous Dorseys ("Everybody's Doin' It"), Big City ("God Bless America," "What'll I Do? "), Jolson Sings Again ("Let Me Sing and I'm Happy," again), Meet Danny Wilson ("How Deep is the Ocean? "), Love Me or Leave Me ("Shaking the Blues Away"), The Great Gatsby ("What'll I Do? "), Pennies from Heaven ("Let's Face the Music and Dance," soundtrack poached from Follow the Fleet ) and The Purple Rose of Cairo ("Cheek to Cheek," poached from Top Hat ). Strangely, Steven Spielberg's Always , whose mood obviously derives from the Berlin song, opts to use Jerome Kern's inapt "Smoke Gets in Your Eyes" instead. Bennett, Sir Richard Rodney Berman, Pandro S.